Time flies so fast. We’re already halfway through January and I’m only starting to share my goals to you just now. Every year, I try to share with you my goals for the year in the hope of inspiring you in your own financial journey as well. Last year, this blog has undergone a lot of changes, the most evident of which is the lack of updates and postings. 😀 I apologize to you my dear readers for that. It has a lot to do with the BIG changes that has been happening to my life as well as the business direction that I want this blog to take in the next months and years. The past 2 years have been a LIFE-CHANGING experience for me. I was an uninspired employee before; Now, I am a very busy and mobile entrepreneur with 2 very active kids. Before, I used to delve into a lot of things, trying out so many. I was exploring into stocks investing, real-estate investing, online blogging, affiliate marketing, e-book selling, and many more. Until I started my own business 2 years ago, all I had was a DREAM that one day, I can live a life outside the cubicle and have a chance to DIRECT the course of my life the way I want it, without my boss or my work getting in the way. Now, it’s been more than 2 years ever since I last held a job and while it’s been full of challenges, I have also learned so many things along the way that I would not have learned otherwise. Not by reading hundreds of books. Not by attending lots of seminars. The life of an ENTREPRENEUR is best learned through the daily action of talking to people, selling yourself and your vision, LEADING a TEAM and overcoming challenges everyday. Over time, you will learn to welcome every opportunity with a smile on your face, and march on inspite of the pressure around you. I don’t claim to be an expert. I only know enough to be able to SURVIVE and BE COMFORTABLE without having to rely or NEEDING A JOB, or have to WORK ABROAD and BE AWAY FROM YOUR FAMILY. That’s why, everyday I work hard, investing time to BUILD MY BUSINESS so that someday I CAN PASS IT ON TO MY KIDS. It’s only been more than 2 years since I started the business but some of my partners are also now starting to get some of their dreams. 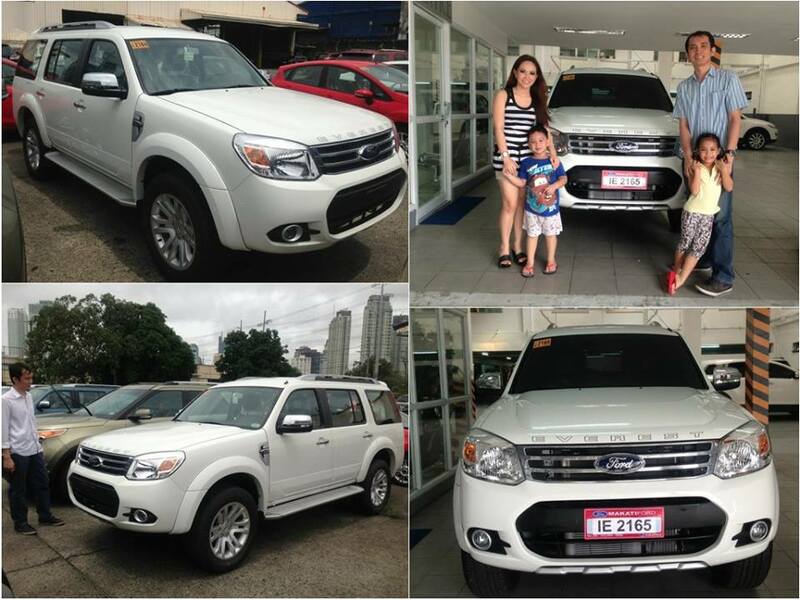 One of those people who first believed in my vision and my ability to execute was my friend Will Abriza, an IT consultant for 10 years, whom I met in my real-estate investing ventures, is still doing the business with me PART-TIME (I tell you he’s earning quite a lot in his IT consulting gig) recently bought his own Ford Everest, a fit car for his growing family of two kids. Here’s the EXCITING PART. Right now, I am looking for NEW BUSINESS PARTNERS for a new project team that I am forming. I am looking for 10 people who would like to be MENTORED and COACHED personally by me and my team of coaches to become like Will Abriza and Francis Lumbo. Contact me if you are interested. Add me as friend in Facebook @ http://www.facebook.com/akosiallan and PM me. Or simple hit the REPLY button to this email. This emails gets sent to thousands of subscribers across the globe. While I would like to be expanding overseas, I want to have a more FOCUSED mentoring and coaching sessions for now. If you are overseas, you are still welcome to send in your inquires. My PRIORITIES, however, would be those who are in Metro Manila, particularly those people who are based or working in Makati or nearby areas. This will make it easier to schedule face-to-face meetings and coaching sessions. It is going to be an EXTENSIVE MENTORING, and it may be the hardest thing you will ever do in your life. You will be WORKING SIDE-BY-SIDE WITH ME until you get your business goals and become successful yourself. You will get to see me up close on how I work, get to ask me questions and receive your answers right away. You will get first-hand access to me, my leaders and my team. You will get a chance to learn from my experiences and of the whole team. I have BIG teams in Singapore and Japan right now, and that would be another advantage for those people living in those countries. If you are not in those areas but are REALLY SERIOUS about becoming my NEW BUSINESS PARTNER, and prepared to INVEST YOUR TIME, MONEY & EFFORT to make it work, then I am not one to say no to a determined person. I’m sure you won’t let anything discourage you from sending me an email and inquiring about my offer. Here’s a similar Facebook Post I shared to my friends a few days ago and the RESPONSE has been simply OVERWHELMING. I received inquiries from all around the country, from QC, Pampanga, Bohol, etc. Some friends overseas also sent their PMs in a span of only a few hours. Now, I am opening the same OPPORTUNITY TO YOU. My goal this 2014 is to help 38 more people become like Will Abriza and Francis Lumbo who are now starting to realize their dreams and get to enjoy the financial and time freedom that a successful business brings. I’m looking for the NEXT SUCCESS STORY to tell. Why can’t it be YOU? P.S. If part of your new year’s resolution is to start your own business or would like to start a part-time where you could earn extra income or would like to check what my business proposal is all about, Contact me . Add me as friend in Facebook @ http://www.facebook.com/akosiallan and PM me. Or simple hit the REPLY button to this email. 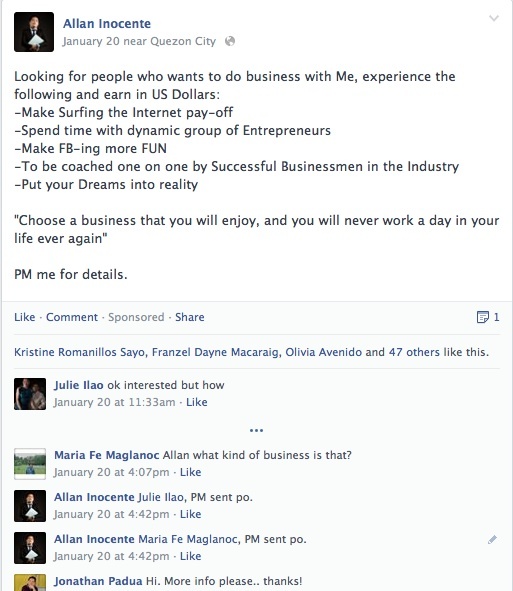 Hi Joan, please contact me or send me a message through my business page @ http://www.facebook.com/allaninocente111. May I know the nature of that business? yes, please visit http://www.allaninocente.com/work-with-allan for more details. follow the instructions listed on the page to take the next steps. thanks!